10 Alone Quote : HOW vs WHY.. the Purpose of life.. 2000 Likes Ten Alone : a saga of 10 friends.. 10 Chartered Accountants..
Purpose of life is a mystery..
You would be able to crack it the day you have an answer to a question. "Whatever you do, Ask yourself just one question..
WHY you do it.. rather than HOW you do it." 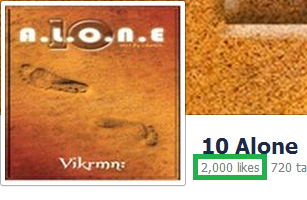 2k likes!!! Short span of time! !